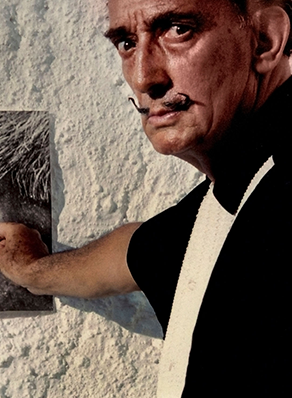 Dalí was famed for his flamboyant behavior and his distinctive upturned moustache. His outlandish behavior often drew popular attention (he was photographed parading around with an anteater on a leash), occasionally overshadowing his artistic output.Though the prolific artist is primarily remembered for his painting he experimented with sculpture, printmaking, fashion and perhaps most notable were his forays into filmmaking in collaboration with Luis Buñuel and Alfred Hitchcock. The artist died in his native city of Figueres at age 85 in 1989. Among the most prolific artists of the 20th century, Dalí achieved both commercial and critical success in his lifetime. There are several museums devoted entirely to his works, including the Dalí Theatre and Museum, Figueres, Spain; the Salvador Dalí House Museum, Cadaqués, Spain; and the Salvador Dalí Museum, St Petersburg, Florida. Additionally, he is represented in the Museum of Modern Art, New York.